Posted April 10, 2017 by HPGhotrodLogin & filed under Uncategorized. One of the things I like to do here in the Midwest is attend estate sales. Sometimes, I find really good model kits at them. One sale I attended, had some really great model kits sitting on a table. They were all from ’59 to ’61. Several were AMT yearly kits, which I acquired and later resold most of them. 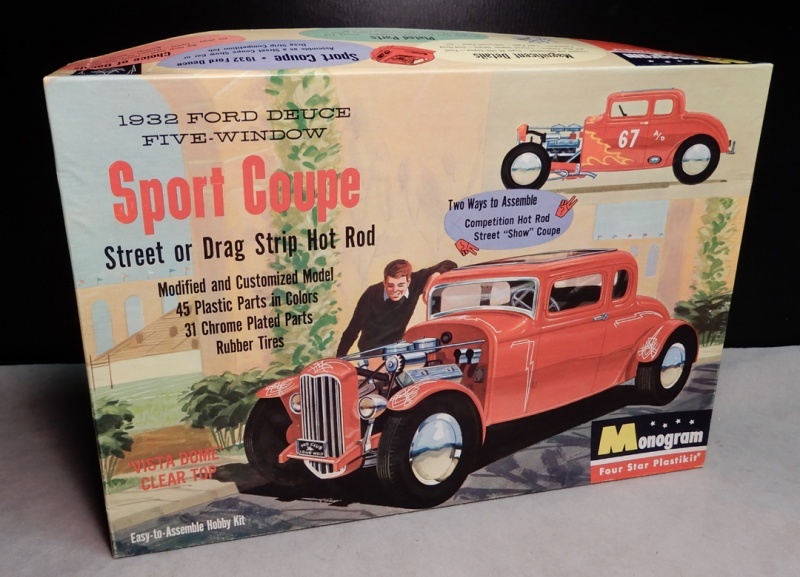 But at the same sale there were these three Monogram hot rod kits. The interesting thing was they hadn’t been started, really. 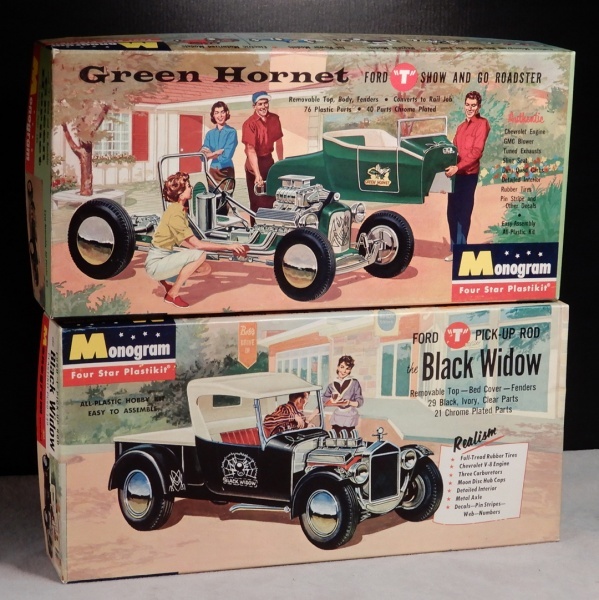 I’ve had several unbuilt Green Hornet and Black widow kits. They were later issues however. But I’ve never seen an unbuilt Monogram Sport Coupe kit before! I know they’re around. Well, while at the sale picking up the AMT boxes as fast as I could, I was saw the Sport Coupe box. Fortunately for me, it was under another kit box so it wasn’t obvious to my competition what it was. I saw the upper corner of the box and part of the word “sport” and knew right away! I couldn’t grab it fast enough. I assumed it was at least partially started or painted. 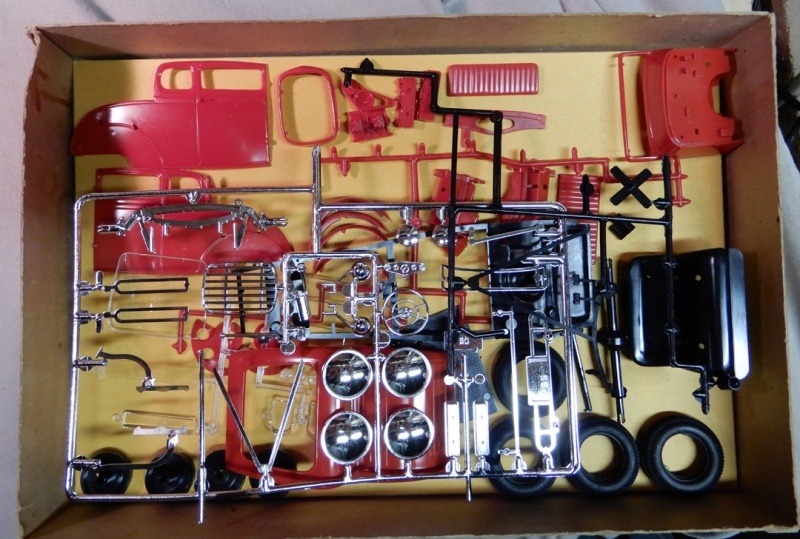 I was shocked when I opened the lid to find it completely unassembled! I have a fairly good built Sport Coupe in my collection. I’ve had several and was able to pick the best one for myself. But this was totally unexpected. 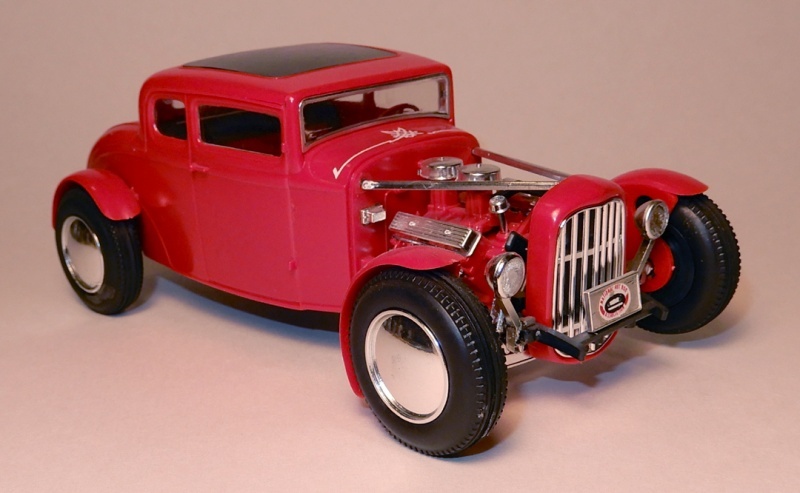 The kit replicated a ’32 Ford five-window sport coupe. It was issued in 1959. In 1960 a motorized version was released and after that, to my knowledge, it was never re-issued. The Monogram 1/8 scale “Big Deuce” and 1/24 “Little Deuce” kits replaced it. They were far better kits than the original Sport Coupe. Their proportions were closer to being accurate. The box lid is in very good condition. There’s a little warp to the side panel from years of storage. I had to replace the box bottom because it was very warped and made it difficult to get the lid off. The box top is not faded and displays well. Notice that the parts set on top of a yellow box insert. All the other kits I’ve had in the past never had the insert! The original decals are uncut. The guy in that catalog always looked like a fast talking salesman to me. The front track on the original kit was far too wide to be true to scale and Monogram used the same size rubber tires all the way around. 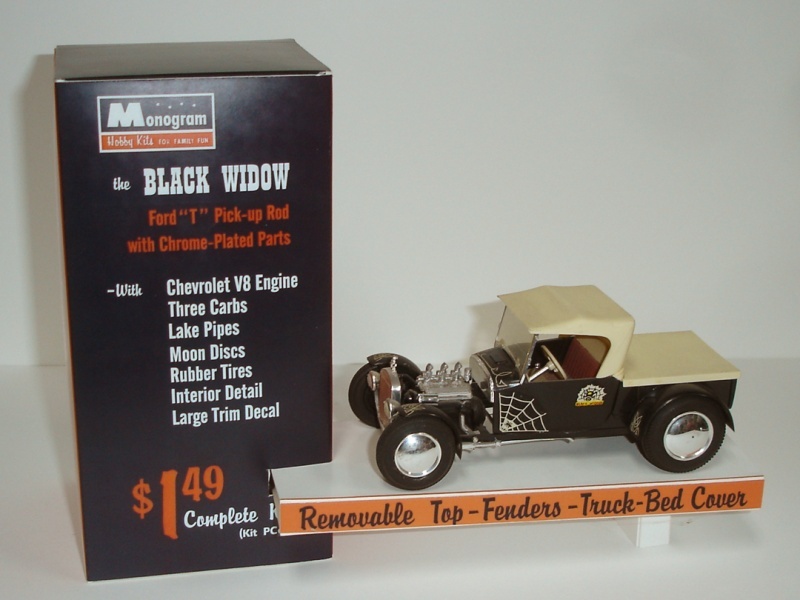 The Black Widow and Green Hornet kits were issued two years later and used the same toy-like rubber tires but at least had smaller tires in front. The Green Hornet and Black Widow boxes are both in remarkable condition. The colors are very bright and rich. I’ve had nice unbuilt kits before but the box lids were always warped and caved in. These are in excellent shape. 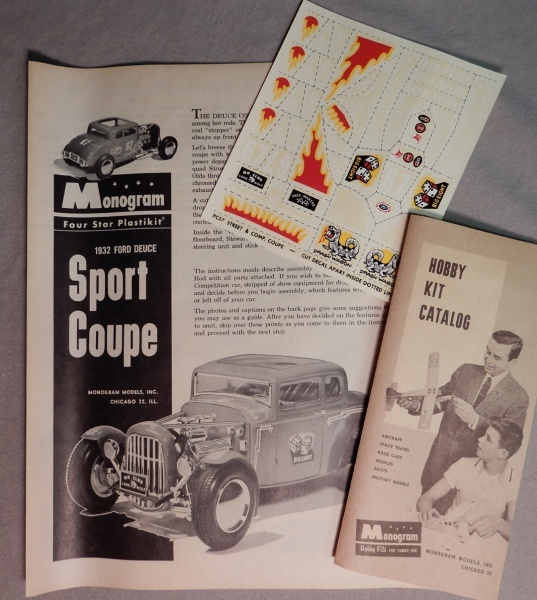 Inside the kits have been preserved well including the decals and little “hobby catalog”. I have had really good fortune lately with finding old models. Many are built and poorly at that. 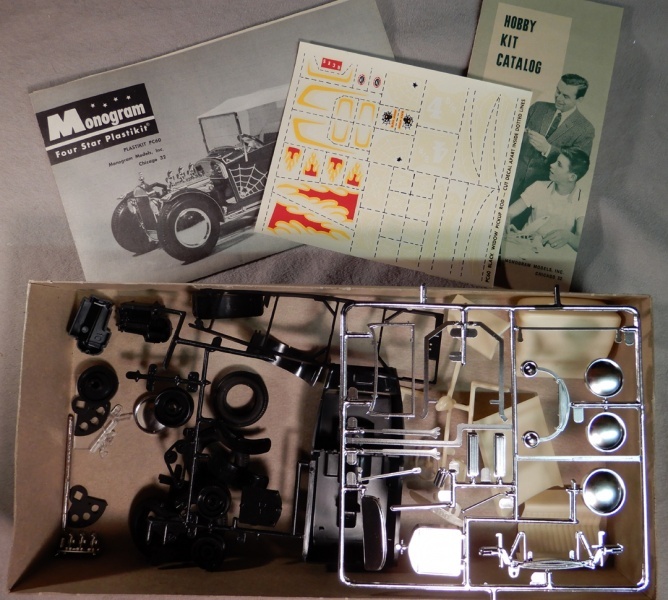 It’s refreshing to find untouched examples of these old classic hot rod kits! They’re a welcomed addition to my collection! Here are the built Black Widow and Green Hornet kits on reproduction store displays purchased on Ebay. 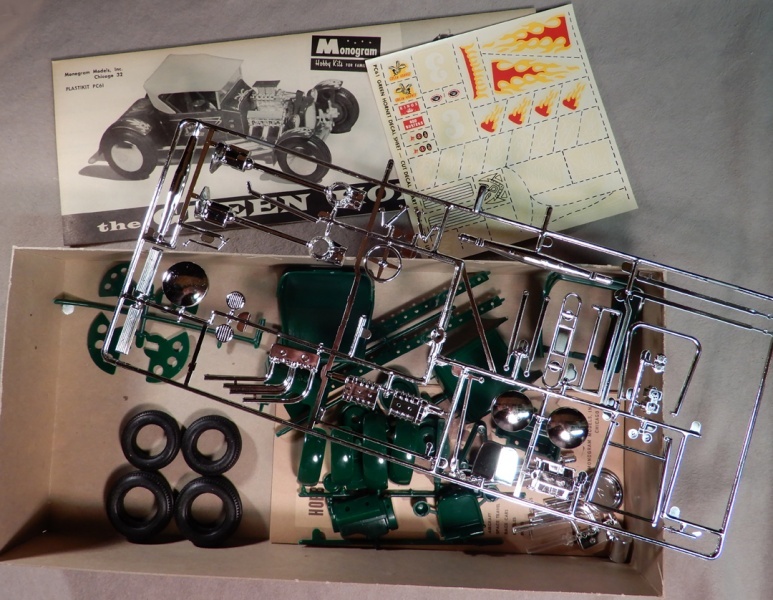 Back in the day, the factory assembled some of the models for use in hobby-store advertising. They had some of the parts painted and even the decals were placed on the kits. The cardboard platforms and back walls were always eye-catchers. The Black Widow kit is one I acquired from a friend. 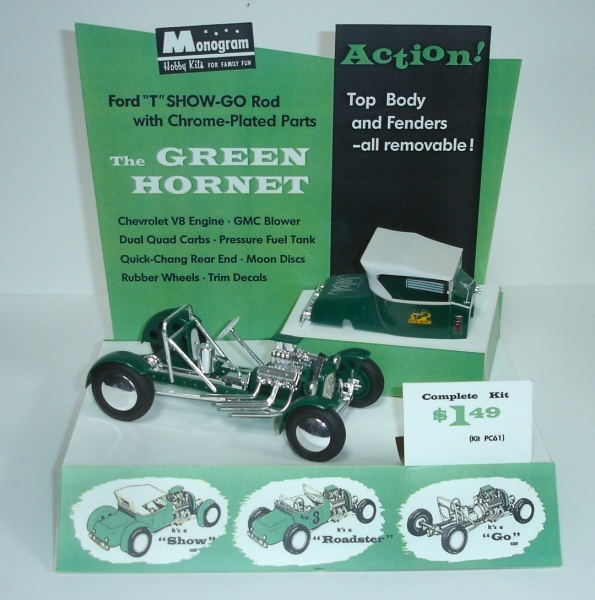 The Green Hornet is a kit I built from an old original issue. The model was inspired by a real hot rod called the Grasshopper. Model Kits have been my thing since I was a kid. I collect them, build them and sometimes provide box art for them.